Mikhail Sergeyevich Gorbachev (Russian: Михаи́л Серге́евич Горбачёв) (b. March 2, 1931) is a Russian politician in the Real World and the final leader of the Soviet Union who helped to end the Cold War, followed by the state's collapse in 1991. He is also known for the birthmark on his forehead. 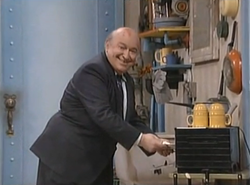 Gorbachev appeared in the animated episode "Plummers Academy" of The Super Mario Bros. Super Show!, being given a tour of Brooklyn by the President of the United States. After Mario and Luigi save them from the flood, Mario receives the Golden Plumber's Helper and Luigi receives the Golden Wrench. Gorbachev himself was actually only seen very briefly while riding in the American President's car, waving to the citizens of Brooklyn. In the live-action segment following Plummer's Academy, "Glasnuts", Gorbachev (played by Martin Gardner) visits Mario and Luigi at Mario Bros. Plumbing to learn how to make pizza. When he piles unusual ingredients onto the pizza, Mario and Luigi become concerned that once he tries it, he'll hate it, and they'll get in trouble for it. But Gorbachev ends up loving the pizza, and decides to open his own pizza place in Russia. This page was last edited on May 30, 2018, at 12:46.